Businesses must come out with new strategies to give boost to the sales and create a new brand image. 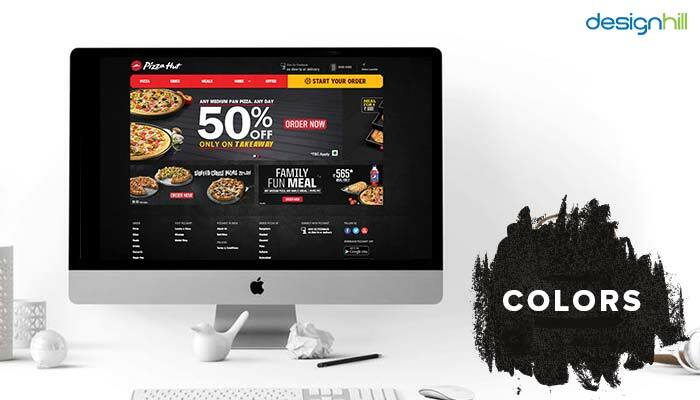 Pizza Hut is one such global giant that revisited its marketing plans and gave it a new identity. It then redesigned its logo. The current Pizza Hut logo is completely removed from its older version. Pizza Hut is a well-recognized fast-food brand having a huge presence across the globe in 93 countries with 15,000 restaurants. A subsidiary of Yum! Brands, Pizza Hut was established in 1958 in Kansas. Now, it garners around $12 billion sales worldwide. One of the major factors behind this company’s roaring success is that it recreated its visual identities whenever needed. This is the reason that most global ventures renew their plans and recreate their core identities. A logo is one such identity. 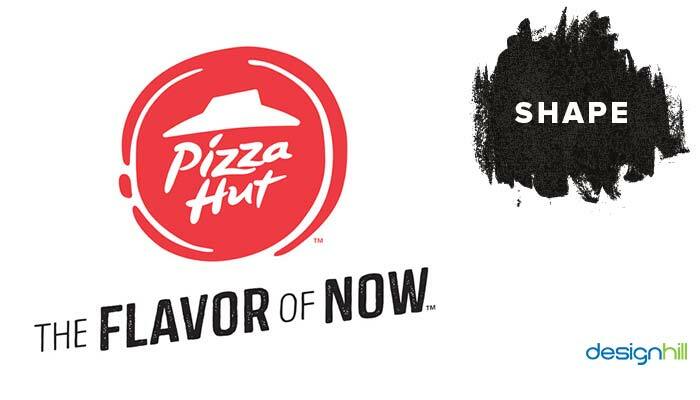 An enterprise like Pizza Hut knows when to redesign a logo and give it a fresh look. Like all global businesses, Pizza Hut also revisits its branding strategy from time to time. It last did so in 2014, when the company, after a lot of research, launched a new pizza menu for the new generation of young customers. The menu was billed as ‘Flavor of Now’. The new menu, in fact, was the biggest strategic change ever in the history of the brand. It introduced no less than 10 new flavors such as Salted Pretzel, Ginger Boom Boom, and Honey Sriracha. Additionally, it had the new range of sauces and ingredients like Fresh Spinach, Peruvian Cherry Peppers, and Salami. The menu added six sauces and five new toppings. To include a wide range of aromas was surely a radical adaptation. But why did Pizza Hut introduced so many new exotic flavors? A reason was continuous fall in its pizza sales. Its sales graph was declining unabated for last eight quarters. That compelled the company officials to do something out-of-the-box to give a boost to the sales. Another reason was that the company observed that young consumers had developed a liking for multiple new flavors through a range of foods. By that time, no entrepreneur had added these rich aromas in pizza. So, they thought of giving their pizza a new tang by using the exotic ingredients for the preparation of its brand of pizza. The aim was to give something unique in taste to the consumers.To make people aware of the new range of aromas included in making the pizza, The ‘Flavor of Now’ menu was publicized aggressively. Along with the addition of the new aromas, Pizza Hut went for some other modifications also. The company reshaped the appearance of its restaurants. This was done as part of the new plan. Also, the pizza box packaging design was altered completely to give it a refreshing look. This shows that when a venture has a relook at its brand, it recreates its visual identities. 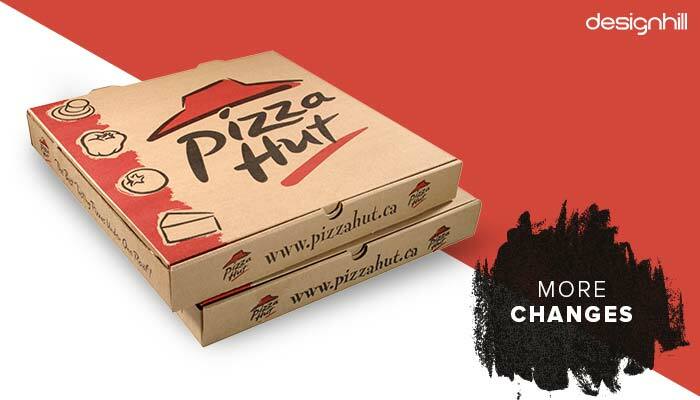 After Pizza Hut came out with the new menu, its logo, which is its most visual identity, also was altered. The company gave a completely new look to the business symbol as part of new branding exercise. 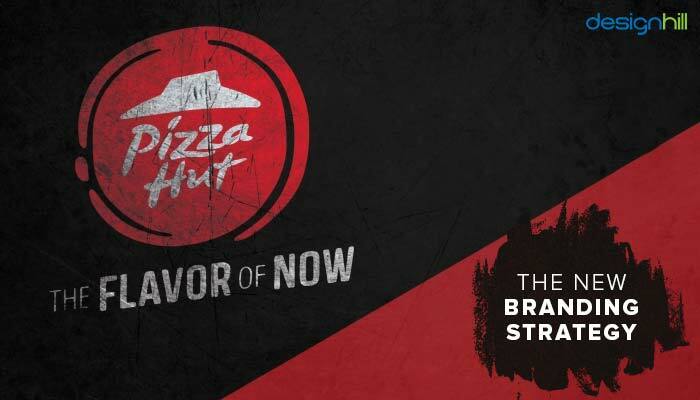 Once Pizza Hut finalized the core plan to lure new pizza-buying Millennials by having the new menu, it was now the time to give a new looks to its old logo. The company, in fact, went a step further in implementing its graphic design ideas. It created an entirely new logo. Since the visual is present in all products, any new elements in the design convey the message to the target customers. 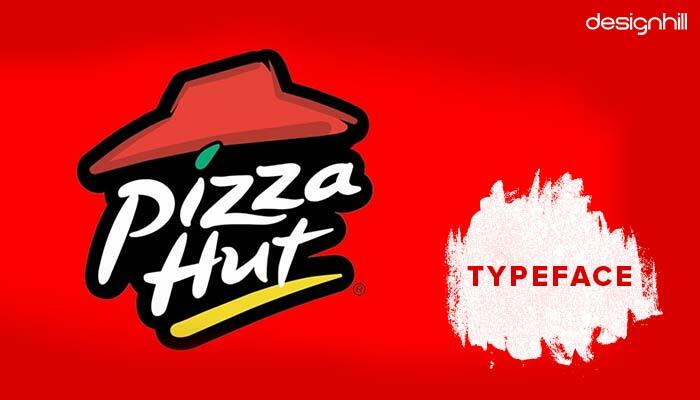 The new Pizza Hut logo was designed as a thin spinning pizza crust on which a smear of the sauce was ladled. The inspiration behind the sauce swirl shape was an observation that tomato sauce moves in a spiraling pattern when applied on stretched pizza dough. The skinny slice pizza design was adopted also because young consumers had become more health-conscious. The sauce swirl shape also represents the new flavors the company introduced. But it is a stylized pizza shape. There was a reason for creating the shape of a sauce swirl.Jared Drinkwater,Pizza Hut’s VP of marketing, once said about the shape, “Any good flavorful pizza starts with a sauce swirl, ….We want to lay our claim to flavor in our category…[and give ourselves] a makeover signaling a changing flavor for Pizza Hut.” So, the swirl shape was included because the firm wanted to highlight the use of new flavors. Surely, a lot of market research was behind the new business emblem.The professionals providing best graphic design services, therefore, get some insight of a business well before reshaping its visuals. Pizza Hut, like other global enterprises, has its own brand colors. The company traditionally had red, yellow, and black in its logo, brochures, professional website design, and elsewhere in their marketing campaigns. But as it redefined its brand, the colors scheme also was reworked. Now, the logo is in one red color only. Rest of the colors yellow and black found no place in the new branding scheme. Red was kept as the sole color for its ability to evoke the emotions of passion, energy, enthusiasm, aggression, and love. These warm emotions are associated with young people, which are target customers of the fast food giant. The alteration from multiple color to one red color couth the eye of new age customers. As far as the typeface is a concern, the company made no changes. It kept the previous typeface in the new logo design. The saucy typeface is in the handwritten style, which reflects the playful and informal environment the pizza restaurants have. The typeface was deliberately kept the same so that people could familiarize with the new visual identity of the enterprise. 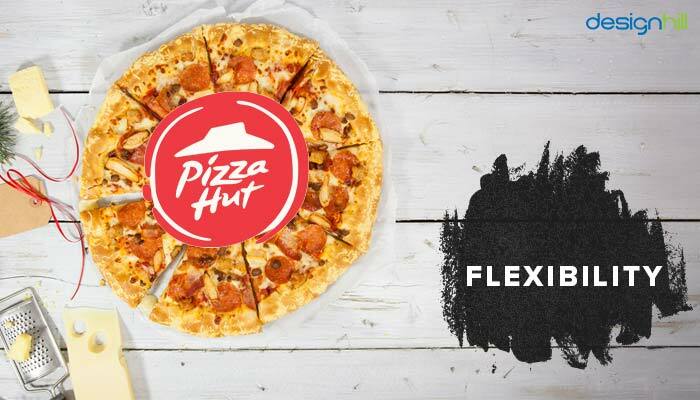 The new Pizza Hut logo is a flexible business symbol. It is in a shape of a thin pizza. It is also a saucy circle graphic. But it can also be used as the roof icon whenever required. The circular shape and a thin disk design give the freedom of using the symbol in varied ways across all platforms. On the pizza packaging boxes of the company, another variant of the Pizza logos was used. The packaging had the sauce swirl shaped logo but the iconic roof symbol was inside it. This was used in Asia first in 2016 and then in South America in 2017. From February to November 2014, Pizza Hut logo was a wordmark. At that time, the green dot on the ‘’i’’ of Pizza was removed. Also, the wordmark was tilted to one side and was moved downward from the ‘’red roof’’’ design. In some countries, this version is still in use. Professional graphic designers understand that a logo must be flexible so that it can be used wherever it is required. The new modification in Pizza Hut logo is not the first makeover. In fact, in 15 years, it recreated the symbol four times. But such frequent alterations in the visual identities are part of natural brand evolution. The first Pizza Hut logo appeared in 1958 on its store. Then, it had the venture’s name in a simple sans serif typeface. In those days, the signages were smaller with a limited space. So, the letters of the enterprise’s name were tightly spaced. The roof shape element was by an architect Richard D. Burke for the company’s store. The current Pizza Hut logo was designed in 2008. That was when the company started offering pasta items. The new version of Pizza Hut logo worked well for the company. While previous sales were plunging, the sales started picking up steadily after the new logo. This shows that there is a deeper connection between branding and visual graphics. If you are also looking forward to giving a fresh look to your existing logo, here is an opportunity. You can send the work to Designhill. This is an ideal platform to create a wide range of designs as per your specific needs. This crowdsourcing marketplace has hundreds of designers. Many of them will work on your project. You can have your uniquely recreated logo in two weeks or earlier. An added advantage for small businesses and startups is that the prices for logo creation are affordable. Moreover, the site has 100% Money Back Guarantee policy that allows you to ask for refunds if you do not like the design submissions. 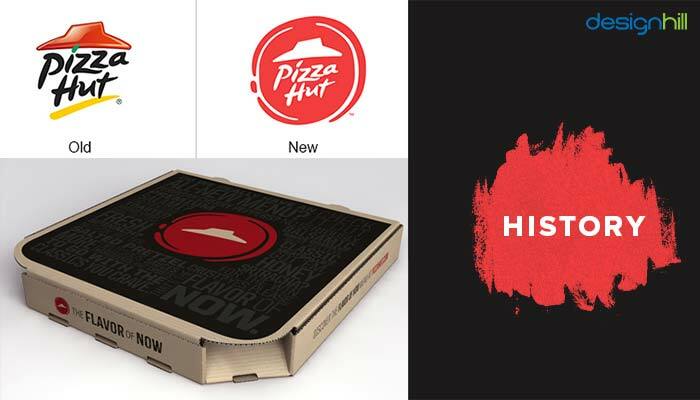 As Pizza Hut started a rebranding strategy, it redesigned its logo. The old version was removed completely. In its place, a sauce swirled shaped design was brought. Only the red color was retained from the older version. This worked well for the company as its sagging pizza sales got a boost.